Broadly framed by Middlefield Road, Loma Verde Avenue, Alma Street and East Meadow Drive, South of Midtown is a peaceful, pedestrian-friendly Palo Alto community. 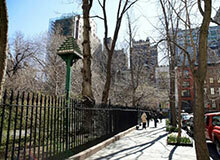 It is also within minutes of the Midtown shopping district and other various Midtown conveniences and amenities. 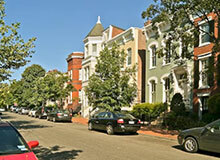 Aesthetically speaking, the district has a fairly old ambiance to it, with homes dating back to the 1930’s. Though there have been a handful of contemporary homes that have added value to the overall real-estate of South of Midtown. Also, parents send their children to local public schools that are all managed under the umbrella of the well-esteemed Palo Alto Unified School District. 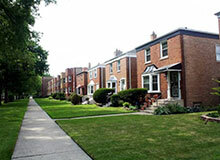 South of Midtown’s residential theme is that of a pleasant, family-friendly community. 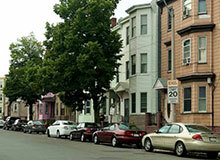 It lies within the upper middle-class as a result of the neighborhood’s general wealth and ambiance. If you’re driving through the neighborhood, you’ll notice how flat and comfortable it can be. 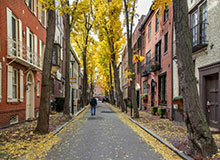 Streets are usually lined with trees, while residences sit on nice, orderly properties. 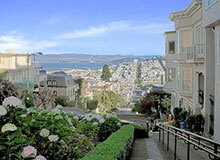 Homes can range drastically in price from $1 million to $2.5 million. Most homes are single-story vintage Eichler (of the post-World War II era) described as “California Modern” Other homes have been torn down and replaced with larger, two-story starter homes with a more modern appeal for young families. The addition of these newer homes have got many concerned over the neighborhood’s historical preservation and loss of original character. For your commercial needs, there is a shopping plaza situated along Middlefield Road which comes complete with a couple convenient stores (CVS Pharmacy and Walgreens) along with a handful of neighborhood eateries and cafes. There is also a row of churches down the street offering a number of different denominations. For young families, students typically attend El Carmelo Elementary or Fairmeadow Elementary, J.L. Stanford Middle School and Gunn High School. These schools often feed their students into the UC school system or even the prestigious, just-up-the-road Stanford University. Also, there is a child care facility that anchors the southern end of the neighborhood. Eichlers, is an equally unusual neighborhood. It is aptly named a “gardens” since the streets really do have a bushy feel to them, with virtually every home having at least one big shady tree in its front yards and some—especially along Ramona—having large drooping trees that seem to swallow up the homes covering them in a dark penumbra no matter how cloudless the sky. In fact, some of the houses are completely obscured from the street with old cars seeming to stick out from a wall of green leaves and little more than corner of the home sticking out here or there. This gives the neighborhood an oddly rustic feel for its fairly densely packed suburban location. The homes here are an equally incongruent mix of older homes, Eichlers and brand spanking new constructions all with slightly odd idiosyncratic touches. Take just one stretch of South Court, for example: you get a modernist style home—all boxy and in shades of grey with desert style bushes and a waist high wall lining the sidewalk; next to this is a low roofed house with solar panels carpeting the roof, and a thigh high well-trimmed hedge along the sidewalk; next to which is what looks like a modernized story book house in green and brown with high church like steeples, a chimney and a recessed red front door. These kinds of idiosyncrasies abound throughout this neighborhood making it a pleasure for walking. This is certainly the antidote to the Ranch house or the planned neighborhood. 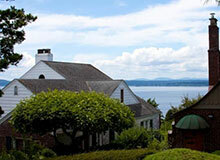 And, in case you are curious, most homes in the area seem to list for above $1 million. The California Caltrain isn’t too far either, so this is definitely a commuter friendly neighborhood if you can afford it. Overall, another wonderfully idiosyncratic Palo Alto neighborhood. Travelling to South of Midtown? "Great addition to downtown Palo Alto, but parking is rough"